Such is Muhammad Ali's standing in the sport of boxing that it is the lot of any man he shared a ring with to be defined by his greatness. But it is difficult for greatness to flourish in a vacuum. So those who remember Ken Norton as so much more than 'the man who broke Ali's jaw' should bear in mind it is preferable to be defined by another man's greatness than to pit your wits against nobody of note and remain ill-defined for all time. And while some have suggested it was Norton's bad luck to have fought in an age so rich in heavyweight talent, a more accurate portrayal of Norton is as a man shaped by the hands of many great men and therefore rendered great himself. @GeorgeForeman: "They called us all handsome. Muhammad they called pretty. But the fairest of them all was Ken Norton." @LarryHolmes75: "My heart has been heavy since hearing the news earlier today. He was a good man. He will be incredibly missed in the boxing world and by many." @MikeTyson: "Today a great man passed away. A legend in the boxing world and a good man. Condolences to Ken Norton's family on this very sad day." Norton, who died on Wednesday at the age of 70, was a central player in heavyweight boxing's greatest era. Ali was undoubtedly the sun at its centre but Norton was one of the mightiest planets in the Ali solar system, a solar system in which the planets regularly collided and created fireworks for the masses. Norton, a magnificent athletic specimen whom George Foreman called "the fairest of us all", rose to prominence with his defeat of Ali on 31 March, 1973. It was only Ali's second defeat - Joe Frazier inflicted his first in 1971 - but it further strengthened his claim to greatness: Where once Ali had dazzled, now he had proved his bravery beyond doubt, fighting with a snapped jaw for 10 rounds. "I took a nobody and created a monster and now I have to punish him bad," said Ali before the rematch six months later, dubbed 'The Battle of Broken Jaw'. But Ali was never able to work out the Norton puzzle. Throwing his jab from down by his waist rather than his shoulder and employing an unconventional cross-arm defence, Norton managed to make Ali look anything but 'The Greatest', bravery aside. Indeed, Norton could have beaten Ali three times. Instead, he lost the return on a split decision and was desperately unlucky to lose the rubber in September 1976, a fight most people watching thought he had won. Norton was knocked out by Foreman in 1974 but stopped perennial contender Jerry Quarry in 1975 before narrowly outpointing Jimmy Young in an eliminator for the WBC title in 1977. At which point boxing politics conspired against him. Rather than defend against Norton, undisputed heavyweight champion Leon Spinks gave Ali a rematch instead and relinquished the WBC belt. Therefore, Norton, born in the American city of Jacksonville, became the first man to win a heavyweight title outside the ropes when he probably would have beaten Spinks comfortably between them. In 1978, Norton was relieved of the WBC title in his first defence, when Larry Holmes narrowly outpointed him over 15 brutal rounds, before his boxing career petered out in that sad way they usually do. "I was never the same fighter after that," said Norton. "I never trained so hard again, never could put the same feeling into it. I was at my best that night, in the best shape I ever was." A first-round knockout by Earnie Shavers was followed by a split-decision victory over the impossibly tough Randall Cobb and a first-round knockout by Gerry Cooney, the latest in a long line of 'great white hopes'. Having retired from the ring, Norton - handsome, charming, articulate - made a smooth transition to acting and broadcasting before a 1986 car crash left him with life-threatening injuries. "My head was split in two," he said. It was a measure of the man's character that he defied the doctors' prognoses and learned to walk and talk again. Then again, what kind of madman would have questioned his character in the first place? This man who stood tall in the greatest age of boxing giants, this man who broke 'The Greatest' of them all. 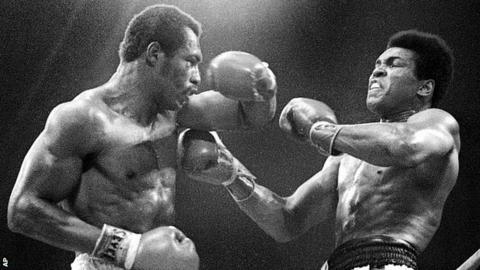 Those boys in the 1970s needed plenty of lumps and bumps to validate their greatness but taken as a whole they make the current heavyweight scene look like virtual desolation. What the Klitschko brothers, Vitali and Wladimir, would give for a Ken Norton now? A magnificent athletic specimen from the United States with hands to shape their greatness.